Tropical Storm Danny Losing Strength, But Still Packs A Punch : The Two-Way The storm, downgraded from a Category 3 hurricane to a tropical storm over the course of Saturday, is expected to continue to lose steam as it heads toward the the eastern Caribbean. 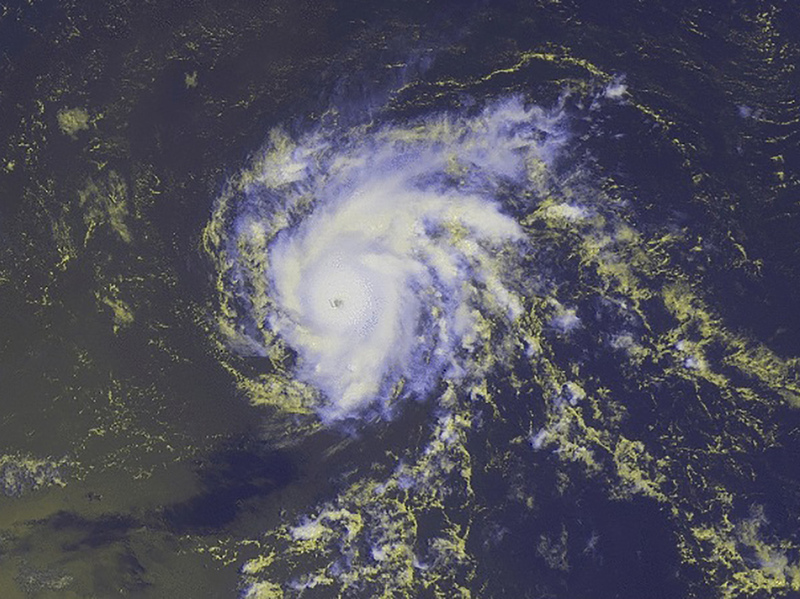 Hurricane Danny is seen in a NOAA image taken by the GOES-East satellite taken at 10:15 ET on Thursday. The storm, now a Category 2, is expected to lose strength over the next day or two. Danny has weakened to a tropical storm, the NOAA has announced, and the maximum sustained winds have dropped to 65 mph. Hurricane Danny has weakened a bit, getting a downgrade from a Category 3 to a Category 2 storm as it moves across the Atlantic toward the islands of the eastern Caribbean. Maximum sustained winds were at 100 mph early Saturday and the center of the storm was located about 740 miles east of the Leeward Islands. The Weather Channel reports: "Danny's eye is no longer distinct in satellite imagery, and its convection near its center is less vigorous. A pair of reconnaissance aircraft from both the U.S. Air Force Reserve and NOAA will fly into Danny Saturday afternoon to better diagnose Danny's current intensity." Brian McNoldy, a senior research associate at the University of Miami's Rosenstiel School of Marine and Atmospheric Science and an expert on hurricanes, writes in his blog that Danny, an unusually compact storm, "is surrounded by dry air and is entering a belt of strong vertical wind shear." "The combination is expected to significantly weaken the storm over the next few days," he writes. The National Hurricane Center, in its latest advisory, says Danny is expected to become a tropical storm as it approaches the Leeward Islands on Sunday. It doesn't currently pose a significant threat to land, but the center says people in the Leewards should monitor the system carefully.